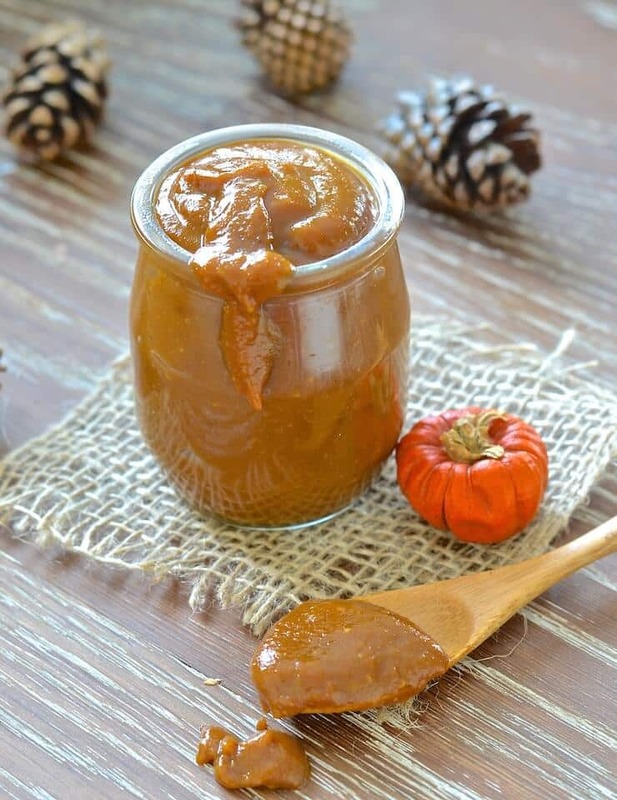 Silky, creamy & rich Vegan Pumpkin Caramel Sauce that takes only 5 minutes to make! It’s so ridiculously easy & is just full of sweet pumpkin deliciousness! Be prepared to want to eat it on literally everything……. You guys are going to be so pleased you came across this recipe today. It is incredibly delicious and I am in love ♡. I hope that you and I will be rivalling for it’s affections very soon. If you have tried my Five Minute Vegan Caramel Sauce then you will know how extremely delicious it is. 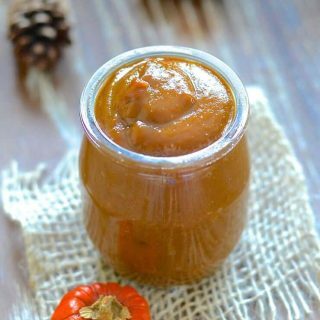 This Vegan Pumpkin Caramel Sauce recipe is made with very similar ingredients and method, only there is a generous dollop of pumpkin puree added for true fall flavour. I switched out the tahini for cashew butter (or almond is fine too) so that the delicious pumpkin flavour comes through and doesn’t have to compete with the strong sesame flavour. It worked really well and the pumpkin comes through beautifully. It also makes the finished caramel sauce a delicious rich, autumnal browny orange. I have eaten this Vegan Pumpkin Caramel Sauce on almost everything recently. It is incredibly versatile. I am even on board if you just want to grab a spoon and eat it straight from the pan. After all, who am I to judge? I might just have been there……. If you give this Vegan Pumpkin Caramel a try, be a ☆ and leave a comment below. I would love to know what you think! You can share your pics on Instagram too. Tag them #avirtualvegan. Put the coconut sugar and water into a pan and warm over a medium heat. When it starts to bubble, remove from the heat and add the cashew butter and salt, stirring until there are no lumps present. Pop it back on a low heat while you do this as it helps it combine. Next add the pumpkin puree and stir until combined well. Add the milk and coconut oil and stir really well again. Store in a sealed container such as a mason jars in the fridge. It will last for a couple of weeks. It will thicken up when cold. To make more saucy just warm through for 20-30 seconds in the microwave, or for a few minutes in a pan. Feel free to add more milk if you want your caramel to be a thinner consistency. The oil gives the sauce a nice glossy look. If you prefer to not use oil in your cooking then you can omit it. 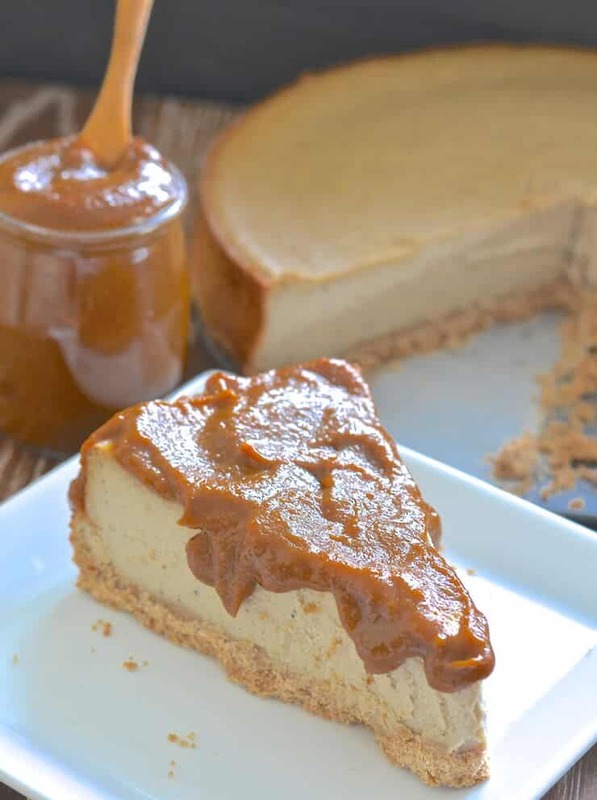 Previous Post: « 25 Vegan Peanut Butter Recipes You’ll Go Nuts For! Just checking…….is that 11/2 cups of sugar and pumpkin puree? or 1/2 cup? You say it makes 4 2 Tbsp servings which would be 1/2 cup total. How can that be when there is already 3 cups of ingredients in it? It’s 1/2 a cup of each (pumpkin and sugar). The entire recipe makes about 1/2 a cup of caramel, maybe a little more. Remember that sugar dissolves when heated so it’s not staying at 1/2 a cup volume throughout, plus things evaporate and thicken up a a bit decreasing volume too. Can I replace the tahini with something else? It doesn’t have tahini in it. Cashew or almond butter is used in this recipe. Perhaps you are thinking of my other caramel recipe? If so, any other nut butter can be used in place of the tahini in that one. ???? What a great idea. Bookmarking, pinning and everything I can think of. It looks delicious and so easy to make. Perfect for Thanksgiving this week! Thank you. It’s so good on everything! I make a similar pumpkin caramel sauce and it is the best! I could just eat it off of a spoon! YUM! I definitely want to try this sauce on cheesecake! It is amazing on cheesecake. My recipe for an awesome baked New York style cheesecake is coming soon! Thank you Cadry, and yes, having easy, quick recipes up your sleeve for when cravings hit is just perfect! Oh my gosh, this looks incredible, and I love how easy it is! Oh yum, that looks INCREDIBLE!! I need some of this in my life right now, love the sound of it hot over a scoop of dairy-free ice cream. Thank you! It is awesome on ice-cream. It would be great in a sundae too! I can’t even! This looks amazing. I clearly need this in my life. Thank you! You do need it in your life. It’s so delicious! when do you add the pumpkin in the recipe?????????? ?